The Trent Canal, connecting the Georgian Bay and the Trent Outlet to the seaboard, has been reputed a prolific source of manipulation by political corruptionists in both parties. In turn, each party in power, has charged the other with chicane practices, if not with the actual robbery of public moneys. Such a state of things reaches a climax, good or ill, and it fell to a clique in the Liberal party eight years ago to make an undisguised attack upon the Engineering Department, by means of which this great waterway had been safe-guarded, so far as it could be safeguarded against political greed and rapacity. This attack first took the form of innuendo, then of cunning rumors of inefficiency, and finally of open criticism of the Chief Engineer, Richard B. Rogers, M.I.C.E., charging faulty construction of channels, dams and locks. A political sensation was the result and the persistent pressure of the influence of a certain section of the Liberal press, led by the Peterborough Examiner, induced the retirement of Mr. Rogers in 1906, upon demand of Ottawa. Prior to this event, of course, the Government had secured a member of the Engineering profession to investigate and the result of this investigation supplied the desired pressure. To what extent the deputized investigator gave credence to current political gossip or adhered to the well established usage and ethics of his profession, are only now definable. "In view of this, I think that the Deputy Minister and the Chief Engineer of the Department acted hastily in not giving Mr. Rogers an opportunity to reply to the finding of the investigation before requesting his resignation." "After consideration of all the facts in this case, I am of the opinion that justice has not been done." "There is no engineering work that I know of that would be exempt from criticism. All canal works have their difficulties and trouble from water during construction." "The best test of work is the final result in completed work. 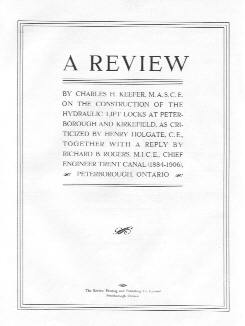 The Work of the Trent Canal, done under the direction of Mr. Rogers is the best evidence that it has been properly designed and constructed and is a work that any Engineer might be proud to have been connected with." "Credit is due the present administration for its action, which, if tardy, has been effective in two important particulars; - first – it has vindicated the good name and integrity of a capable public servant, and, second, - it indicates the purpose of the present administration to free the public business from partisan dominance with its attendant evils. Maybe Mr. Rogers’ case was, of necessity, laid over in view of the intention of Ottawa to redeem the Trent Canal from a bad reputation and it has actually done much to that end in the recent exposure of venality by the efficiary that succeeded Mr. Rogers." In connection with the foregoing, we think that the control of public works, the letting of contracts, and the supervision of public works should be put beyond political interference. The public business should be conducted on the same lines as those of large private corporations. For instance, when contracts are let for public works it is well known that all kinds of political influences and schemes are put in motion to gain some advantage for party politicians. How much more economical and businesslike it would be instead of having all the bids privately opened by some political head, to have all the bidders privileged to be present when the bids are opened. Such a course would nullify the suspicion of partisan [favourtitism] and insure conscientious competition. Such a system has been operative in the United States and has proved most satisfactory. The supervision of all Federal contracts is in charge of the Corps of Engineers of the U.S.A., which is not only free from political influences but subject to strict discipline by the officers of the Corps. It would hardly be possible for any member of the Corps to lend himself to any political influence, as has evidently been done in the case above referred to, or in any way to act so as to bring the least stain upon the profession. It would be of great advantage if the Engineering profession of this country were put on the same high moral plane. Canada now maintains an expensive college at Kingston for the training of engineers but when its graduates leave college there are neither fixed regulations nor standards to hold individuals to the ethics of an essentially ethical profession. It seems feasible that the graduates of our Engineering Universities could be formed into some such Corps as that of the USA To that end we will be glad to have suggestions from members of the profession. Written by Ryerson Ritchie, Secretary of Chamber of Commerce New York.